This Chapter includes information on the city of Dee, a wild and lawless community in the Swarming Beggars region. It is built atop the caves of A’zhu, whose mysterious powers have corrupted its people. It is a city of gangs, bloodshed, intoxication and pleasure. 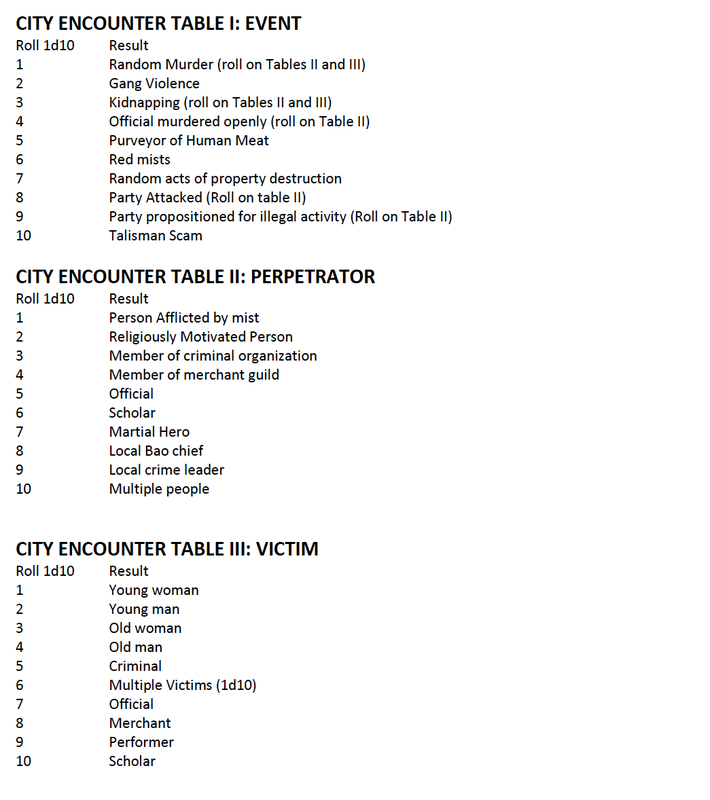 This chapter includes a description of the city, entries for its major gangs and a small sample encounter scenario at the end. 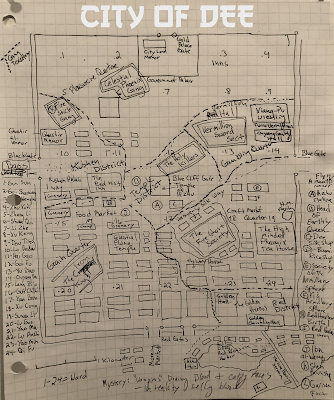 Note the city map is from my personal campaign and as a result it has notes concerning adventures that probably won't mean much to most readers. I made Dee so there would be a place for powerful characters to have adventures. For weaker characters being in Dee can make a good weekend in hell scenario, but for more powerful ones, it is an ideal place to rise and make their fortune. It is heavily inspired by the movies The Blade (1995) and Detective Dee and the Mystery of the Phantom Flame (2010). Dee is a rowdy city that always seems on the cusp of revolt. The King assigns a magistrate to govern here as a city lord with 288 soldiers. But this is a highly undesirable position, being wedged squarely between the Demon Lands, the Caves of A’Zhu and on the border of the kingdom itself. Earthquakes and a strange red mist are regular occurrences. Many martial heroes come here as it is easy to slip in and out. The people of Dee are aggressive, not law abiding and seem to grow more tolerant of violence and bloodshed the longer they stay in the city. Something simply seems strange about the place. The city seems a place plunged into chaos, ruled by the strong (usually criminals). The current city lord is Yan Buwei. He was appointed three months ago and spends most of his time hearing cases and petitions in the Government Palace hall. His real function is to prevent Dee from becoming a source of rebellion in the kingdom. He is expected to enforce what laws he can, but the condition of Dee is accepted for what it is by the King and Queen. Buwei relies heavily on a version of the Baojia system to maintain some semblance of order. Under this system areas of the city are divided into groups of one thousand households called Baos (these are in turn subdivided into smaller units). In order to collect taxes and maintain order, he must go through the different Bao chiefs (or Baozhang). Over time this has resulted in more crime, not less because it produces trained men capable of organized violence. Today most of the Bao chiefs are little more than petty criminals who answer to the more powerful gangs operating in the city. 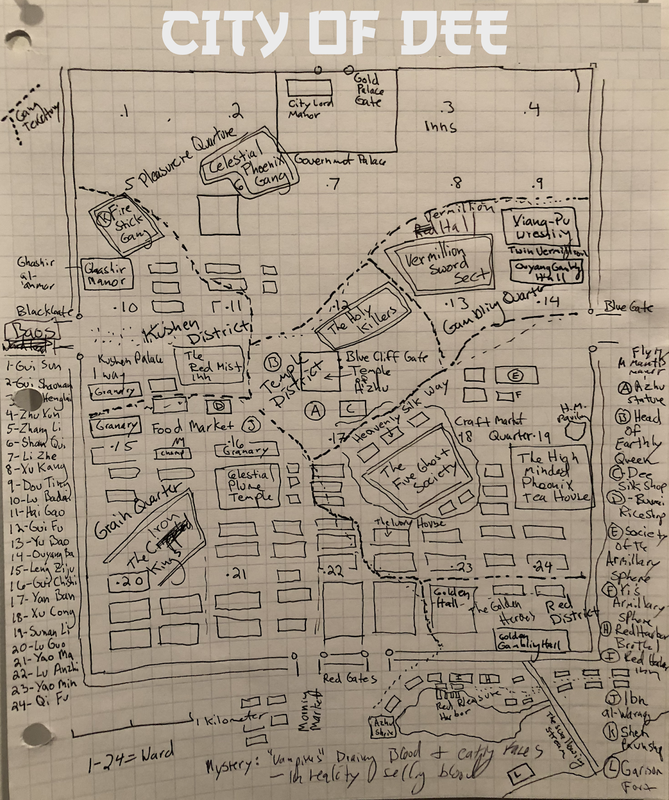 So, for Buwei to get anything done in an area controlled by the gangs, he needs to deal with the Bao chiefs there, but also with the gang leaders as well (who can control the Bao chiefs with a simple command). Further, Buwei is effectively under the control of Thundering Guan of Celestial Phoenix Gang. Without her support, he has no power. She has made his position more difficult by imposing a heavy restriction on his authority: the harshest penalty she allows him to impose is twenty beatings with the heavy stick (and then only in extreme cases). The true city lords of Dee are the men and women who lead its many powerful gangs. 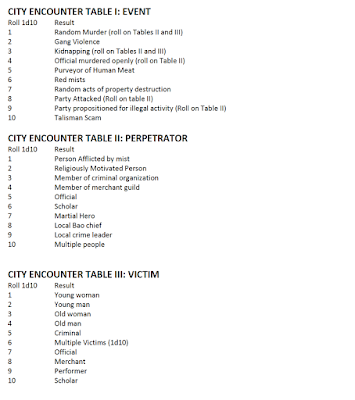 The city is overrun with violence, kidnappings, murder. Massacres are a regular sight for those who live here. 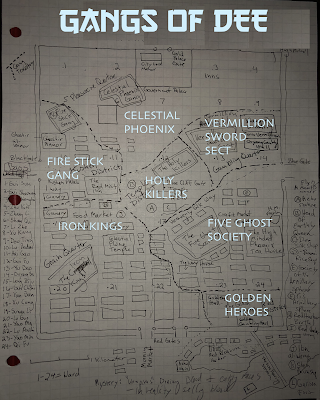 The gangs of Dee are: Celestial Phoenix Gang, Vermillion Sword Sect, The Fire Stick Gang, The Iron Kings, The Five Ghost Society, the Holy Killers, and the Golden Heroes. The most powerful and influential of these are the Celestial Phoenix Gang (who effectively have control of the Yan Buwei) and the Holy Killers. All the gangs are described below in their own sections. The city is open to many religions, but the chief god of the city is A’zhu, who they believe dwells below the city controlling the earth itself, keeping the demons and spirits at bay from entering. The Temple of A’zhu and the Holy Killers perform rituals in order to prevent the demons from being unleashed. The Holy Killers prowl the streets regularly to collect bodies to deliver to A’zhu or turn into jiangshi at their temple. Dee is unique for its practice of human sacrifice. This is done each month, with twenty-four victims in all, by the Holy Killers at the Temple of A’zhu. Each Bao must pledge one person every month. They believe that if they do not perform this regular sacrifice, the city will erupt with earthquakes and be overrun with demons. There is truth to this. A’zhu demands the regular sacrifices for her own purposes and views the city as a foothold in Qi Xien for the Demon Emperor. When they fail to sacrifice she punishes the city with violent earthquakes and sends demons to the surface if this fails to motivate them. The taboo against consuming human meat is also broken here, with vendors regularly selling dishes of human meat and butchers engaged in the practice of selling cuts of human meat (there is a whole industry in Dee around the practice). New Blood: Enough people come to Dee to make their fortune or because they are sent here by the queen (this is one of her methods for dealing with criminals) that the population always remains fairly steady. People are commonly adopted into clans as well, so the clans can remain strong. Patrolling Inspector Yao Wu: Yao Wu is the patrolling Inspector of Dee, which is a military post, similar to a sheriff, except his jurisdiction is primarily the area around the city, and his duties are to control smuggling, banditry, and to seize lawbreakers. He also oversees training of the Baojia men. He has 100 soldiers and a small garrison outside the city walls. He deals with Yan Buwei regularly, but his true loyalty is with Celestial Phoenix Gang. Patrolling Inspector Yao Wu pretends to be a fool. He is really quite talented but he knows any of the local gangs, sects, or even the queen herself, could have him killed with a mere gesture. By playing the fool he often encourages others to step in and take action so that he doesn't have to. His primarily goal is to survive by pleasing the Queen and not offending the powers in the Swarming Beggars region (particularly the gangs of Dee). The Red Mists of Dee and the Red Calm: These red mists appear in the city periodically and afflict those who breathe them in with an anger that can only be quenched by blood. Anyone exposed must pass a 2d10 Resolve Test or become affected and behave with violence towards those around them. Anyone who experiences the effects of the Red Mist (directly or indirectly) feels a cathartic sense of spiritual awakening or insight. It is an experience that becomes a fond memory in hindsight. Those who have seen it often speak longingly of witnessing the red rage again. Anyone who lives in the city for more than a month begins to experience the Red Calm. They feel at ease in the presence of blood and death, murder ceases to phase them, and even when they hear of others nearby being killed in mass slaughter, the sense of threat this should present is dulled. Make a 3d10 Resolve Test every month the person is in the city. If they fail, they are affected by the Red Calm. Anyone with Karma ratings of 4 or high is less susceptible, and only has to pass the test after the first three months. They also sense something amiss. Certain talismans can ward off the calm and anyone who is a direct descendant of Sunan and Bao, is immune to its effects. The effect fades after a year away from the city. Celestial Plume: This is a fragrant oil, burned in censors that creates altered states of consciousness. It comes from Naqan. Anyone who breathes it in suffers a -2d10 to all Reasoning Skill, Detect Skill, Wits and Knowledge Skills. However, they gain a +2d10 to Meditation, Divination, Muscle, and Empathy. They are filled with euphoric vigor which lasts for three hours. After the effects fade, the user lose a point of Hardiness every ten days which doesn’t come back for a full month, but never drops lower than 1 (and comes back instantly if they try more Celestial Plume). Note: I am expanding on this in the "Sons of Lady Eighty Seven" book. Encounters happen all the time in Dee. Roll on the following tables twice a day. There are 24 Baos in Dee, each led by a Chief who is usually a local clan head. Baos are like neighborhoods or wards. They are divided into smaller groupings that approximate to blocks and streets (which have their own subchiefs). A typical Bao in Dee is made up of 1,000 households of 10-15 people each. This makes them much more chaotic than in other locations. Each Bao chief is responsible for maintaining order among the households under his authority and in emergencies they are called upon to raise men for fighting. Under this system the eligible men within the Bao will be asked to perform military, law enforcement, labor or other duties required by the city. This is rarely invoked. Most Bao Chiefs are little more than minor crime bosses, and their cooperation is vital for the larger gangs (see below). This is a complete listing of the Bao chiefs. Each of the following people controls the corresponding Bao listed on the map. So Gui Sun controls the north west corner of the city while Qi Fu controls the south eastern portion of the city. Some of the more influential clans have multiple Bao chiefs. If you see a surname repeated multiple times, assume these clans have more power than the others (surnames are the first part of the name). All of the Bao chiefs are male except for Yao Min. She isn’t just the leader of Bao 24, she also leads the entire Yao clan in the city, including Yao Ma, the chief of Bao 21. Yao Min has firm control of the local ivory trade and is on good terms with the Five Ghost Society. There is a rivalry between the Gui clans and the Yao clans in the city. They don’t vie for territory but have a longstanding feud, the source of which is forgotten. Now the grudge is merely about which clan deserves greater praise. Most Bao men are equipped with Short Bows or small blades. While it is easy for people to aquire weapons in a city like Dee, local ordinances limit the Bao men to using bows. This area is filled with smithies and workshops. There are also a larger number of food stalls and fortune tellers plying their trade here. The area is under the control of the Five Ghosts. The High-Minded Phoenix Tea House: This looks like a place for scholarly poets and aristocrats. They have the finest teas, served by staff dressed in golden and silver brocade. Musicians and other services are also available. Despite the high standing and demeanor of the clientele, this is one of the most savage establishments imaginable. Men and women come here to impress the gentry with their most inspired lyrics. But the audience has been known to chop off limbs, slice out tongues and kill for a poorly delivered line of poetry. Still, if you can impress the house, you have the undivided attention of people with considerable influence in the city. The Society of the Armillary Sphere: This is a society of astrologers, who specialize in predicting the fated calamities of individuals by analyzing celestial bodies and birth dates. They examine the individual’s Year/Month/day/hour of birth and compare that with the birth times of other people in their lives. They have never been wrong about a prediction, though predictions rarely play out exactly as they describe them. In truth they afflict people with Fated Calamities. They are headed by Yi Zhu (see Yi’s Armillary Sphere for more details). Yi’s Armillary Sphere: This large tower like structure is capped with a working model of the heavenly bodies and realms. It is an aid to astrological divination. It was constructed by a man named Yi Zhu who is also the head of the Society of the Armillary Sphere. The secret of this Armillary Sphere is it is cursed and produces Fated Calamities for individuals. You can simply give the Calamity or Curse Demon Flaw, or you can assign them an impending calamity as part of the Fated Flaw. An impending calamity is a terrible thing that fate intends them to experience. This could be a gruesome attack by thousands of wolves, a potentially lethal encounter with a god or spirit, or something more mundane but significant. Fated Calamities have uncertain outcomes, but are usually very challenging and can result in death or worse. Xiang-Pu Wrestling Hall: This is part of the Twin Vermillion, two big attractions in the district (the other being the Ouyang Gambling Hall). The manager of the hall is Pan Anzhi, a large man in his mid-60s who is close to Madame Tian of Red harbor Brothel in the Red District. Ouyang Gambling Hall: Ouyang Ba, the Bao Chief of the district, is also the manager of the Ouyang Gambling, but ultimately he serves the Vermillion Swords. Vermillion Sword Sect: This is Vermillion Hall, the headquarters of Vermillion Sword Sect. See their full entry below for more details. This is where the city granaries are kept. Most of these are reserve for times of famine, but they can also be used to influence local rice prices. Control of this area is disputed between the Fire Stick Gang and the Iron Kings. Ostensibly, these belong to the king of Hai’an. In practice they should be under the control of the city lord, in truth they belong to the gang that holds the most influence and territory in this part of the city. There are also lots of shops in this quarter (especially rice shops and bun vendors). Ghashir Manor: This opulent residence is occupied by Ghashir Al-‘Anmar, a Naqani merchant who controls a network of Celestial Plume sources and brought his goods to Dee about twenty years ago. At the time there was another house in control of the trade, but he eliminated them and is now secure. However, he needs the protection of local criminals to do business and recently allied with Fire Stick Gang when they took over the district. He is protected by his body guard Amir ‘Abd Al-Ghashir. Red Mist Inn: Sometimes this is simply called ‘The Chrysanthemum’. The Red Mist Inn is five stories tall with a massive central dining area on the first floor. The rest of the inn rises up like a tower overlooking the central dining area. The tower is lined with a spiraling balcony and stairway and private dining areas fan out from the tower like petals of a flower. The proprietor of Red Mist Inn is Shen Gao and all the servers are member of the Shen family. There is a wide array of food (all under listed prices on page 188 of the WANDERING HEROES OF OGRE GATE rulebook). However, quality is very high and consistent. The Fire Stick Gang pretty much control the inn. In fact this is where Fire Crow King often dines with his men (usually in a private area on the fifth floor). When Fire Crow King is present, the Inn is filled with at least 100 Fire Stick Gang men. Also, the Inn is rigged to go up in flames at a moment’s notice. They understand he is likely to be attacked here. So, the place has been refitted to burn quickly, and the upper floors have been filled with Divine Powder to explode when triggered (the key for the trigger is possessed by high ranking members of Fire Stick Gang). This could also be used against them however by those cunning enough to exploit it. Anyone caught in the explosion takes 6d10 Open Damage. Plus, if the Inn is on fire at the time, there is potential for taking 3d10 to 6d10 Fire Damage every minute. Each floor of the inn is 15 feet high (meaning there is a potential 75-foot fall from the top balcony). This is all information that could be important should a fight break out at the Inn or an ambition group attempt to kill Fire Crow King. Shen Pawnshop: This is a front for Fire Stick Hall (the headquarters of Firestick Gang). This is where the best wines, brothels, and music can be found. It is under the control of the Golden Heroes. Red Pleasure Harbor: This area is lined with wine shops, musician stalls, small troupes of acrobats and actors, and connects to a canal that leads to the River of Swarming Beggars. The harbor itself is known for its brothel boats, places of pleasure and gambling where martial heroes and criminals often do business. Red Harbor Brothel: This brothel is operated by Madame Tian. The establishment is popular and a big draw from all over the city. Occasionally, a person dies of poison, but no one has ever definitively connected such deaths to Madame Tian and those who die are never missed. Madame Tian is lovers with, Pan Anzhi, the manager of the Xiang-Pu Wrestling Hall. But she is also lovers with White Ghost of The Five Ghost Society. She often poisons people at their request. This is controlled by the Holy Killers. It is also where the Temple of A’zhu is located. People fear and respect the Holy Killers, and therefore this part of the city tends to be free of the violence found elsewhere. The Red Mists only strike when the Holy Killers wish within the bounds of the Temple District. Also, whenever someone dies in the city, their remains are dragged her to the temple by the Holy Killers and offered to A’zhu or turned into Jiangshi. See the HOLY KILLERS entry below for more details. There are several gangs and other organizations operating in Dee. They are described below with entries for each of their key members. Many of them have techniques described in CHAPTER SEVEN: NEW KUNG FU TECHNIQUES. Some techniques are simply described in shortened form beneath the character entries. This group is the most powerful gang in the city. They control the northern Pleasure Quarter and control the City Lord, Yan Buwei. The Celestial Phoenix Gang are poets and scholars and follow Thundering Guan (a Guan is a double reed woodwind instrument). She wants to take control of the entire city and has allied with the Fire Stick Gang to achieve that (she believes controlling Celestial Plume will be crucial to their success). 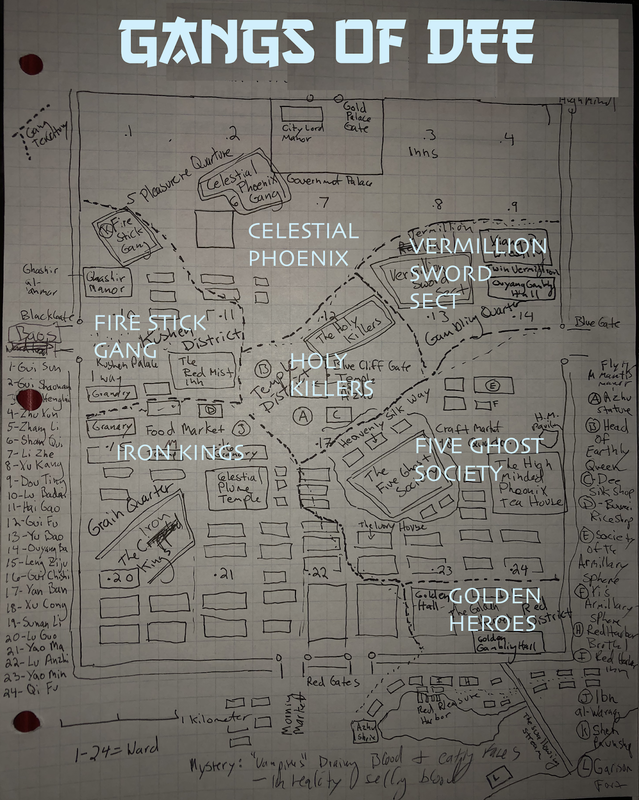 Celestial Phoenix Gang understands the value of currency and has a vast network of robbers, unscrupulous merchants and an affiliated network of scholarly bank thieves. Dee is their home base, but their activities extend far out beyond the city. Celestial Phoenix Gang has scholarly affectations but their interpretation of the classics and Dehua are somewhat unorthodox. They hold officials in very low regard because they believe they have strayed far from the original intent. In their view a certain amount of disorder and chaos is to be desired for a truly harmonious society. Thundering Guan was the daughter of a scholar in Xuanlu. Her father was an upright and just man, but didn’t understand the subtleties of politics. He accidentally angered Queen Ai Nu and was imprisoned. Her mother stole to survive and feed her children but was caught. She was forced to commit suicide. From then on Thundering Guan was raised by the criminals and bandits that her mother dealt with. Thundering Guan rose to prominence in the south, eventually forming a group of bandits of her own called the Celestial Phoenix Gang. Under her leadership they became a powerful force and took over the northern Pleasure Quarter of Dee. Thundering Guan despises corrupt officials and is especially hateful toward magistrates who inflict harsh punishments. However, she is not above using corrupt officials toward her own goals. She is also not opposed to murder but has an extreme dislike of criminal codes. Thundering Guan delights in chaos and sees Dee as a sea of endless opportunity. Yes it is violent, yes there is random bloodshed, but to her this is the necessary contrast to its peaceful temples and ornate halls. It is a place of beauty in her eyes. Chamba is from the far south and a master physician. His skills are unrivaled, but his methods unorthodox. He often examines the corpses of the dead to further his craft, but his true desire is to perform such inquests on living people (which Thundering Guan prohibits). He greatly admires the Holy Killers, and he resents restrictions placed on his experiments by Thundering Guan. One day, he hopes to find an opportunity to join with them. He is most famous for his thirty-point needle technique. These are the female subchiefs of the sect, all directly below Thundering Guan. They are also her longest serving allies, having been with Celestial Phoenix Gang since its early days of countryside banditry. As the name suggests they are all skilled at poetry, but really regard themselves as scholars. When they kill, they commonly leave a poem written in the blood of their victim. The 20 Scholars are a group of men who have studied all their lives for the scholarly exams and never passed. Growing desperate for wealth and status they banded together and used their extensive knowledge to plan precise and undetectable bank robberies. They were invited to join Celestial Phoenix Gang provided they paid regular tribute from their activities. In exchange they receive protection and information on potential targets. The thefts of the 20 Scholars are truly astounding, being bloodless and undetected. They are masters of counterfeiting as well, which has allowed them to replace what they steal with fakes, delaying the realization of the theft. These are the enforcers of the sect. Like the poets above them, they are all women. They often lead small groups of bandits but are also used for muscle and function in teams of 10 when the organization needs to make a point. Though murderous and tough, they still have scholarly affectations and emulate the manners of Thundering Guan. They still prefer the Ox Tail Dao to the Jian Sword and this forms an unusual contrast with their attire and demeanor. These are the thugs and thieves of the organization. This is a mixture of men and women. Few have scholarly aspirations here, these are folk who seek riches and survival. The Fire Stick gang is cult-like group who control an area known as the Kushen District and portions of the grain supply. Originally, they just controlled the Red Mist Inn, but slowly took over the other establishments. They are a kind of religious cult, who believe in the divinity of flame and its ability to transform things. They have many contacts in the Kushen Basin and Naqan, and they always form identical groups wherever they obtain power. Every single Fire Stick Gang in every city has a Fire Crow King for example. The Fire Stick Gang only recently acquired control of the Kushen District, taking it from the Iron Kings. This has triggered a major war between them because the Kushen District is key to controlling the Celestial Plume trade, and Celestial Plume Temple is within the Iron King’s sphere of influence. The source of Celestial Plume is Ghashir Manor. Since Fire Stick Gang gained control of the District, Ghashir Al-‘Anmar has allied with them. Their headquarters, Fire Stick Hall, is not widely advertised and disguised as the Shen Pawnshop. His real name is Cheng Shu and he is a thick man with a heavy moustache and eyebrows. He wears trousers, boots, a hat and loose-fitting shirt. He is haughty and believes the wine shops, granaries and inns of the Kushen District belong to him. He governs his holdings like an official or king. His one virtue is he is kind to beggars and the poor. He cannot abide anyone harming them and regularly holds charity feasts for such people. However, his empathy is strictly limited to the poor and does not extend to merchants, shop owners, high born scholars or artisans. The poor of the city hold him in high regard and his authority can be said to be greater than the officials. Fire Crow King was once a man of healing and compassion. In his youth he was the student of a great physician, but his master abandoned him to seek fortune on the road. Left to his own devices he had to learn to protect himself and deal with local bullies. Over time, his personality changed as he witnessed with his own eyes, the cruelty that men were capable of. Now he sees most men as beasts, needing to be ruled with a harsh fist. The Five Ghost Society is a criminal organization led by five chiefs, each embodying one of the Five Ghosts (WHOG, 226). They control the local ivory trade, extort workshops and craftsmen, and are trying to take control of the Celestial Plume trade as well. They provide services such as assassination for high fees. The entrance of their headquarters has five plaques that read: Murder, Lies, Theft, Intoxication, and Power. Each of the chiefs of the sect models his personality and attire after one of the five ghosts. The leaders of the sect are White Ghost (Murder), Silver Ghost (Theft), Orange Ghost (Lies), Green Ghost (Intoxication) and Black Ghost (Power). All the chiefs fight axes, except White Ghost, who fights with chain whips. The leader of the group is White Ghost, who often just calls himself Murder. Though they are honest about their wicked natures, they all possess the ability to use this honesty as a way of putting people at ease and deceiving them. Though they are perhaps weaker than some of the other people in the city, they have created the illusion that they are more powerful by spreading lies. Lashing Tiger: You lash out with your Chain Whip at up to 1 Target per Qi rank. On a Success anyone hit takes 2 Automatic Wounds. On a Total Success you automatically Restrain the target. Cathartic: Does 3 Automatic wounds. Hidden Axe (Counter): This must be used cathartically. You dip and twist, bringing your arm up with an axe from a hidden position to slice the throat of your foe. Roll against Attack Roll. On a Success you do 6 Extra Wounds. Twirling Axe: You throw your axe with alarming speed and power. This must be used Cathartically. You throw your axe at a target at -1d10 but do 2 Extra Wounds on a Success. On a Total Success you maim the target. This is a group of men who dress in scintillating golden robes and reside at Golden Hall. Their appearances and mannerisms are feminine. They present themselves to the world as heroes to the city. Occasionally they make public displays against villains in the city, but this is just a pretense. Anyone they risk life and limb to fight has something of value they need, and these are usually little more than territorial disputes. Most recently they wiped out the Jade Lion gang from the area around Red Pleasure Harbor in this manner. The Golden Heroes control portions of Wards 24 and 23, but this is a disputed area and therefore they are in conflict with the Five Ghost Society. They extract a tax from all criminals in this section of the city, and they have direct control over all brothels, gambling houses and inns. They are also allied with the Vermillion Sword Sect. The Golden Heroes are practitioners of Phoenix Essence Kung Fu. This requires a greater balance of Phoenix Qi in ones body and is easily mastered by women. Men who try to learn it suffer painful death. However men who perform the Phoenix Essence Ritual regularly using the blood of young women, can master the techniques of Phoenix Essence, as it makes them more feminine. Fragrant Sword has a wily sense of humor and playful personality. He is handsome and in his early thirties, but due to the practice of Phoenix Essence, his features have become softer and more pretty over time. His manners are gentle and seductive. He has many lovers in the city. The one he loves most is an old woman named Qixia the Candied Fruit Vendor, who resides in a small homestead outside the city (see here entry in CHAPTER SIX). He is not embarrassed in the slightest by their relationship and smiles knowingly at any who mock them. The Golden Heroes are the sub-chiefs of the organization. They all dress in matching metallic golden robes, and have feminine features. Like Fragrant Sword they have mastered Phoenix Essence techniques using the Phoenix Essence ritual. The Golden Swords wear brown silk robes and are the core disciples of the Golden Heroes sect. The Holy Killers are the priests of the temple of A’Zhu. Known for their mysterious connections to the Red Mists and extensive knowledge of the past, they make regular human sacrifices to A’zhu. The priests go through the city to gather the dead as they find them and then bring them back to the temple to offer to A’zhu or turn into Jiangshi. The Temple once possessed the Sword of Time but lost it. They used it to go back in time and take the heads of major historical personalities. Presently they hope to obtain it again and would pay well to anyone who can help them. The temple is led by Ritual Master Gao Shu, who is helped by Right Vanguard Xinshen and Left Vanguard Jingshen. Their chief disciple, White Browed Tiger, roams the world freely. The Temple of A’zhu is built upon a gate that leads deep below the city. The gate is sealed with a stone eye that vents red mist. When they sacrifice, victims are thrown into the eye. The Pavilion of Mind: This is a large pavilion, where the Right Vanguard of the Holy Killers resides. From the ceiling, severed heads are suspended. The heads are all historical personalities, severed by the sword of time and placed in the hall. Notably the Righteous Emperor’s head is present here. The heads answer questions. Speaking to the heads is no free service however. One must make a pledge to the temple, a deed to be performed at a later time. The Pavilion of Spirit: The left vanguard of the temple resides here. This contains the harvested dragon spirits of powerful martial heroes and demons. Each one is placed inside a glass orb swirling with red mist. Each Orb can be used as a weapon, unleashing a terrible blast of Qi on targets for a d10 damage equal to the Qi rating of the trapped spirit (+1 Extra wound for every Qi level over 10). Only the Left Vanguard and White-Browed Tiger can wield the orbs (as doing so requires having a Ritual of Spirit tattoo). Anyone else who attempts to touch them takes the full damage they would unleash. If the orb is shattered, then the demon or martial hero escapes. When this occurs, the red mist activates a kind of local prison, creating an expansive mist. Jiangshi Hall: The priests regularly gather dead bodies around the city and bring them to the temple. Some, they offer to A’zhu, but most they allow to become Jiangshi and then place paper talismans on their foreheads to control them. At any given time, they have 1d1000 Jiangshi standing in a large and locked temple hall. To simulate the d1000, roll 3d10 and add each result to a sequence of three digits. For stats on Jiangshi, see WHOG, page 368-369. Ritual master Gao is an old and skilled Ritual Master, losing faith in his own abilities. He is strong with a thick build and short beard. He has striking red and black hair. Gao is devoted to protecting the world from the powers below but this has worn him down over time. He is fully committed to his position and is willing to do anything to advance the knowledge of his organization. He has a son named Gao Liao who he once loved but now despises and wishes to see killed. He has a red tattoo of dog on back. Left Vangaurd is a cautious man, charged with protecting the spirit orbs of the Pavilion of Spirit. His skin is scaly, green and metallic. There is a red tattoo of a monkey on his back (this is from his Ritual of Spirit). He does not trust Right Vanguard and hopes to become protector of both pavilions by demonstrating his rival’s disloyalty. Right Vanguard is a handsome man who dresses in fine robes and always tends to his appearance before meeting anyone. He is obsessed with the history of Qi Xien and master of the Pavilion of Mind, where he cares for the heads of historical figures (see Pavilion of Mind above). He adores his position and has few complaints in life. The only thing that bothers him is the sight of anyone more handsome or beautiful than himself. For this reason, he is pleased that the Left Vanguard has such a hideous appearance. White Tiger is harsh and likes to fight, but is a righteous hero. He is also uncouth and shamelessly proud of his physique (often parading it around with little but an undergarment). He rarely sets foot in Dee as he objects to the methods of the Holy Killers, though he understands why they do what they do. The only part of their efforts that he is willing to be part of is the capture of wicked demons. Therefore, he ventures forth, frequently to the south, to ensnare them. He has a tattoo of a red tiger on his chest and this makes him immune to the Red Mists and allows him to safely handle the orbs from the Pavilion of Mind. On his back he has a white tattoo of Queen Jiangnu, the southern thunder goddess. White Browed Tiger is having an affair with Queen Jiangnu, and stays at her Thunder Palace in the swamps of the far south. He is in love with her but comes and leaves at her pleasure. The Iron Kings control most of the granaries, some of the Celestial Plume Trade and the food market. Their control of these things was stronger before they lost portions of territory to the Fire Stick Gang. Prior to their conflict with the Fire Stick Gang, there were nine Iron Kings. Five were killed defending one of their granaries. With only four, they consider this a very unlucky and dire situation. They are looking to recruit new kings and will seek powerful martial experts outside their organization if they must, so they can once again have nine leaders. The Iron Kings value physical strength and require all their members to train daily and condition their bodies. They are somewhat vain about this matter. In addition to prizing physical strength, mental endurance is another quality they value. The Four Iron Kings are the remaining leaders of the sect. They each train in the same style and have similar abilities. The Four Iron Kings are Yao Yun, Yao Kang, Yao Fu, and Yao Ban. Though the Four Iron Kings speak boldly and with arrogance, they are all fearful that their sect will soon be destroyed. They all question its ability to survive. One of them, Yao Ban, is considering working with the Celstial Phoenix Gang and betraying his brothers. These are the captains of the sect. They generally wear trousers and walk bare-chested through the streets. These are the foot soldiers of the sect. They dress in trousers and wear open chested jackets. The Vermillion Sword Sect controls the Gambling Quarter and does not believe in rigid hierarchy. They accept the group must have a leader, but that leader should treat the sect as brothers and sisters. They have no use for formalities, refusing to bow to one another or to anyone outside their sect. They believe that all men bleed vermillion and this means they are fundamentally all the same. They despise the Dehuan worldview and instead respect philosophies, spirits and gods that go against tradition and the orthodox. They admire Gushan, and have an unusual admiration for Heng, but this is only admiration, not worship. They reject completely, servitude and slavery. Any who practice this within their district, they kill. Their headquarters, Vermillion Hall, is special. It was the site of a great massacre when Zhendao took over the district. The halls were painted with the blood of the previous sect who controlled the area, The Harmonious String Sect. Accounts differ but most agree that Zhendao heard the booming voice of a goddess, who commanded him to establish the hall as his permanent headquarters and forbid any shedding of blood inside the hall. Anyone who sheds blood here acquires the Fated Flaw. Zhendao is a former slave whose face is branded with the name of his former Master (Zhao) and branded with the mark of a thief. He has covered these up with the images of a lion but they are still vaguely visible. His body is heavily scarred and looks like it may have been badly burned. He wants revenge against the Dutiful Empress and is from the future. Zhendao is fair to his men, dresses in resplendent red robes and carries a butterfly swords with vermillion blades. He never bows, and his men never bow. Nor does he ever expect anyone to bow to him. He treats all his men as equals and the only display of respect or loyalty anyone makes is a knowing nod. Zhendao came to Dee in his after escaping slavery and travelling back in time. His stubborn refusal to submit to anyone earned him the adoration of many in the Gambling Quarter. He founded the Vermillion Sword Sect and eliminated the previous gang who controlled the district: The Harmonious String Sect (they were killed in a massacre everyone in the city recalls). People do don’t know Vermillion Sword came to Dee from the future with the help of a strange cult. In the future he comes from, he helped restore the Dutiful Empress from an imprisoned state but angered her and she showered him in blood that burned his flesh. His desire for revenge against the goddess led him to a cult on Rong Shan. He was sent back to use his foreknowledge so he could take over the Gambling District and assist the rise of a man named Crazed Raksha. The Crazed Raksha has yet to appear. Zhendao does not know who the Crazed Raksha is. He was promised a way to find a God Killing blade would be revealed if he helped Crazed Raksha’s rise. Granny Chang’s Flailing Daggers: You make a flurry of circular strikes with two daggers. Make a Light Melee roll against up to 7 targets within striking distance. Do normal damage on a success. Cathartic: Each attack does +1 Extra Wounds. For more information on this technique or Granny Chang see her OGRE GATE INN AND THE STRANGE LAND OF LI FAN, pages 61 and165. Granny Chang’s Thirteen Dagger Strike: You crouch and throw a bundle of daggers at your foes. Make a Light Melee Skill roll against the Evade of up to 13 targets. On a Success do Normal Damage. Cathartic: Each attack does 1 Automatic Wound. This is a small encounter that can be turned into a larger scenario. Just something different to do in Dee. The players hear rumors and reports of a strange red mist spreading through the pleasure quarter and red district. The mists are thick and create Dark conditions (-2d10/-2 to affected skills). Inside the mists people are being slaughtered by a powerful creature: Lady Xiang. The more people Lady Xiang kills, the more her red mists grows. The local Bao Chiefs are offering a reward of 50,000 spades to anyone who can put a stop to the threat. If the problem continues, the Golden Heroes will personally offer to pay 500,000 spades to anyone who can put a stop to it. The mist is a result of an Orb being taken from the Pavilion of Spirit at the Temple of A’zhu and shattered in the Pleasure Quarter (see HOLY KILLERS entry for information on the Pavilion of Spirit). White Ghost stole her orb from the Holy Killers and released it in the area to he could attack the Golden Hall when they are weakened by it. He shouldn’t be able to handle the orb but is using the gloves of Divine Murderess to do so. Lady Xiang is a spirited elephant with mighty tusks. Her flesh is a deep cherry red color and she is engulfed in a growing red mist that expands as she devours more human flesh. She has two black tusks and stands nearly 30 feet tall at the shoulder. When she wishes she can appear as a beautiful woman with bright red hair and black robes. In this form she carries a golden cudgel. Lady Xiang is the daughter of Lord Demon Horn (WHOG, 365) and the sister of Lady Qing’er (TOURNAMENT OF DAOLU, 4). When her father was cast from Heaven, she was also exiled. This filled her with rage and anger, and she went on a terrible rampage through Dhamma. While shedding blood at the Banyan Sage, she was told that one day she’d be a powerful queen and people would worship her. She began to force the locals in the Jin Suk Valley to worship her as a result. She was captured by a Holy Killer from Dee, who placed her in an orb. He had come because he was curious about her red mists and wanted to know if they were related to the Red Mists of Dee. What Lady Xiang doesn’t realize is she is the daughter of A’zhu and Lord Demon Horn. This is the source of her unusual ability. Mighty: All physical attacks by Lady Xiang Horn roll Open Damage. Cudgel Strike: Lady Xiang can rapidly strike up to 10 targets with her cudgel (and throw at a range of 20 feet if need be). Against this attack all counters must be made twice. The attack does 5d10 plus 3 Extra wounds on a success. Charge: On a Charge with tusks, Lady Xiang does an Extra wound. Change: Lady Xiang can alter her size to be smaller (as small as a mouse) or change her appearance (to look human or like an animal). However in human or animal form, she suffers a -1d10 to all skills, so prefers to stay in her natural form when she can. Weakness: Any object made of Jade inflicts 5 Extra Wounds against her. Control Red Mists: Lady Xiang can control Red Mists and produce it herself. She is very weak when released and has to build up her powers again. At first this just allows her to spread the mists around her in a blinding fog. After a week of consuming human meat, she gains the ability to control all the terrain, objects, and structures within her foggy shroud. This allows effectively allows her to shape the reality of all non-living things inside this zone. After a year of consuming human meat, she can begin to alter life and create living beings that spawn from her thoughts.